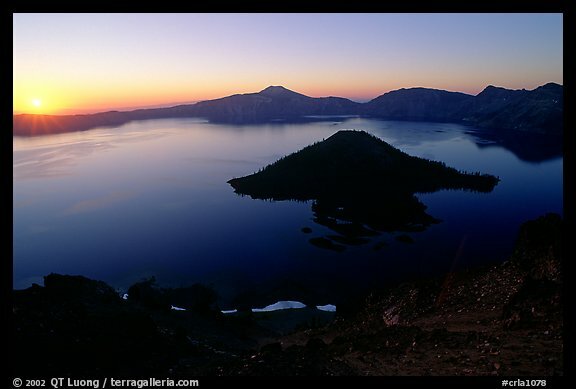 Crater Lake is always stunning at first sight. No other lake combines such a nearly perfect large circular shape, deep blue color, and uniformly sheer surrounding cliffs almost two thousand feet high. However, past the first impression, many of the viewpoints around the lake lack either an unobstructed view, or interesting features. For this reason, I usually concentrate only on a few locations along the 33-mile drive that circles the lake. Of these, the first I would recommend is the fire lookout on the Watchman. Mt Scott is the highest peak around the lake, but it is slightly distant, while the Watchman raises directly on the lake rim, above tree line. In addition, the Watchman is right above Wizard Island. By far the largest of the two islands in the lake, Wizard Island has an interesting shape that varies with viewpoint. From most locations on the rim, the top of Wizard Island merges with the opposite rim, but on the Watchman (even just at the trailhead), you are high enough to separate them. The trailhead to the Watchman is about 4 miles from Rim Village. The trail is 0.7 miles each way with an elevation gain of 300 feet. Although the main attraction are the expansive views from the top, in summer, there are also a great number of wildflowers along the trail. From October to early July, he trail is usually covered in snow. From late autumn to late spring, the road from Rim Village to the Watchman is normally closed. The Watchman is a great place to capture a rising sun above the lake. Then, in early morning, the lake is backlit, but by late morning, the sun rises high enough to reveal the incredibly blue color of the lake. The lake is at its more intense blue by mid-day, in summer, on a calm day. I have found the color to be less intense in the afternoon. If you’d like to capture the whole lake, you’d need an unusually wide angle lens. A 17mm will not suffice, the first two images below were shot with a 20mm and 24mm respectively. A panoramic format would work best since the foreground isn’t that interesting. The last image was done by stitching together two 17mm frames. It was not taken from the top of the Watchman, but rather from the overlook close to the trailhead, which is an alternative if you don’t want to hike the short, but steep trail. 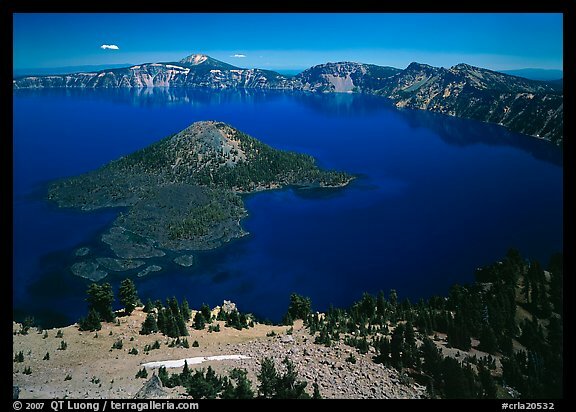 Thanks for this information on Crater Lake. I will be heading there this morning to shoot some photos to put on our Bend real estate website.